The Damp2Dry 250 Pint Commercial Dehumidifier by Perfect Aire features a digital, soft-touch electronic control pad and up to 250 pints per day water removal capacity at saturation (142 pints per day AHAM rated). The unit draws 10.4 Amp of current operating at 1180-Watt. Power supply is 15 Amp, 115-Volt. The relative humidity range during operation is adjustable between 26% and 90% and the unit can operate in extreme temperatures (33°F � 100°F). The unit also features a durable, fixed metal handle and a lightweight, roto-molded polyethylene housing that are ideal for industrial use. Some of the other main features include: an easy access slide-out washable/reusable air filter, 24 hour timer function, automatic defrost control (hot gas bypass), direct-to-drain hose access with 40 ft. hose, heavy duty never flat tires, 25 ft. power cord and built-in duct attachment ring for connecting a vent hose (sold separately) to direct the heated exhaust air to help assist in water evaporation. The unit weighs 81 lbs. and comes with a 1 year full replacement warranty. Perfect Aire commercial dehumidifiers use eco-friendly, non-ozone depleting refrigerant (R410A) allowing for higher system efficiencies, reduced power consumption and increased durability and reliability of the compressor. ETL listed in both Canada and the US. Tbook.com crawls the web to find the best prices and availability on Industrial Hardware and related Tools and Hardware products like 120 l/250-Pint Industrial Size Dehumidifier. For this page, related items include products we find that match the following keywords: "Industrial" at our vendor partner Home Depot. 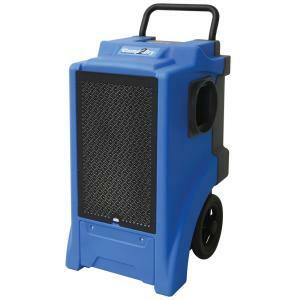 120 l/250-Pint Industrial Size Dehumidifier is one of 143 Industrial Hardware and related products listed in the Tools and Hardware section of Tbook.com If you have any questions on this product, please give us a call at 734-971-1210 during the hours of 9am - 5pm EST for assistance. Thank you for shopping at Tbook.com, the Internet Department Store!